We are a leading Manufacturer of stainless steel u bend, s s ferrule fitting 304, stainless steel long stub end and 304 elbow fittings from Mumbai, India. Stainless Steel Long Stubend offered can be made available by us in different configuration choice with bend choices from D18mm to D1220mm. These seamless tees, reducers, caps and other pipe fittings can be made available of steel plate. Some of its features include high-medium-low pressure stubends; widely used in long-distance piping engineering; suitable for use in industry sectors like petroleum industry, pharmaceutical, chemical industry, construction industry; available in metal choices like alloy steel, carbon steel, stainless steel; seam and seamless finish. We are offering wide range of Elbow Fittings. 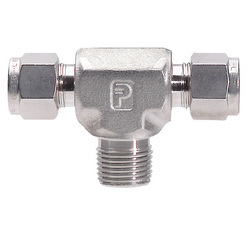 Our elbow fittings are available in stainless steel, brass and monel including male elbows, female elbows and union elbows. Our products are acclaimed for their cost effectiveness and reliability by our clients.